Turning flat sheet material into a closed box with 4 wheels. 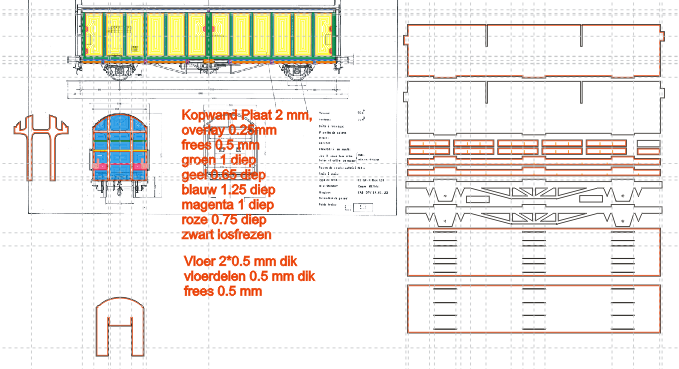 The above drawing from the NMBS wagon documentation was used as base for setting out a new drawing with milling plan in Corel draw. Corel drawing with cutting plan using colours for cutters and depths (Note this is not the final plan). The above plan shows the wagon base and internal reinforcements drawn up using tabbed construction in 0.5 mm ps and the sides and heads to go with that. The plan is using colours for different depths and cutters. The paths are directly generated in Corel using the contour function. The text documents the various colours because that is important but volatile information which I tend to forget before the project is even finished. 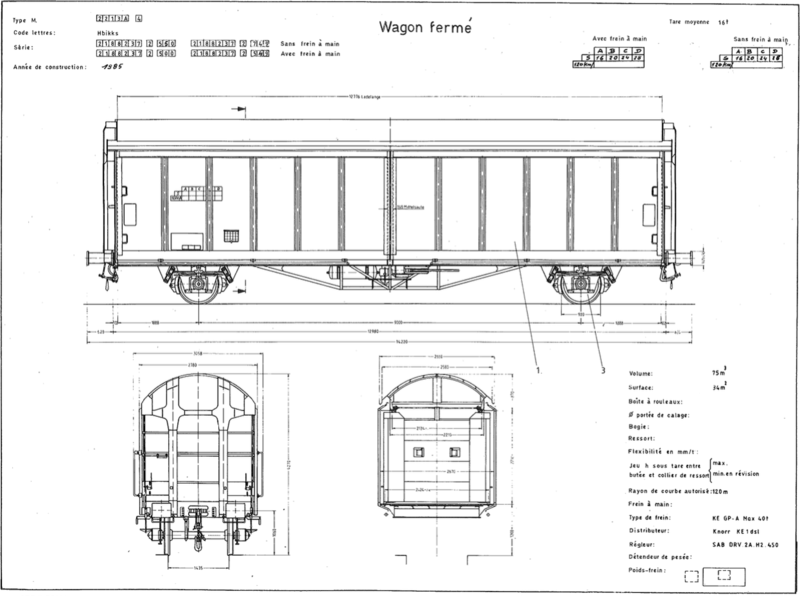 The only 3D drawn components used for this wagon are the springs with roller bearing and the buffers. Also the buffers are milled from PS, this even being faster than turning them on the lathe. Not shown in the above drawing (because outside the viewport) is the roof. This is also milled from 0.5 mm sheet and curved by wrapping it along a 15mm rod and dumping it in boiling water. 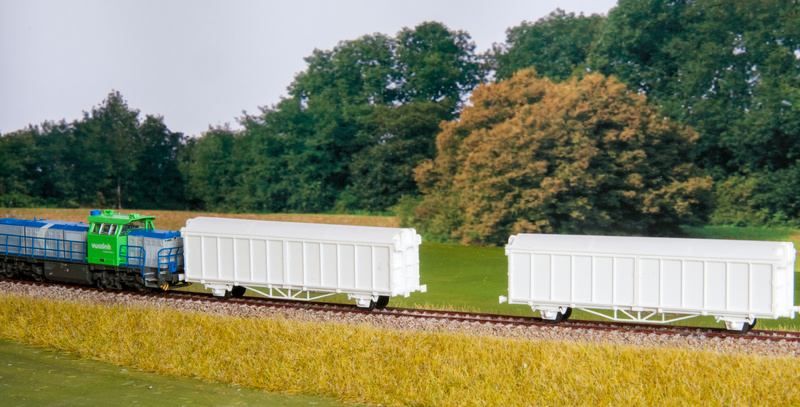 Photo showing 2 new near complete wagons in white polystyrene. The loco is a G1700 by Hobbytrain, good and fine running model but much too light of weight, resulting in pick-up problems at start from zero far too often, even with the original traction tyre wheels replaced by full metal ones. The tabbed construction turns out to be quite robust but proof of the pudding is in the eating of course. Thus the next Fremo meeting will be used to see if this construction is rigid enough to keep the wheels in. The only metal used are 4 tophat bearings in the W-irons, the 2mm axles and a piece of lead glued with epoxy for weight. 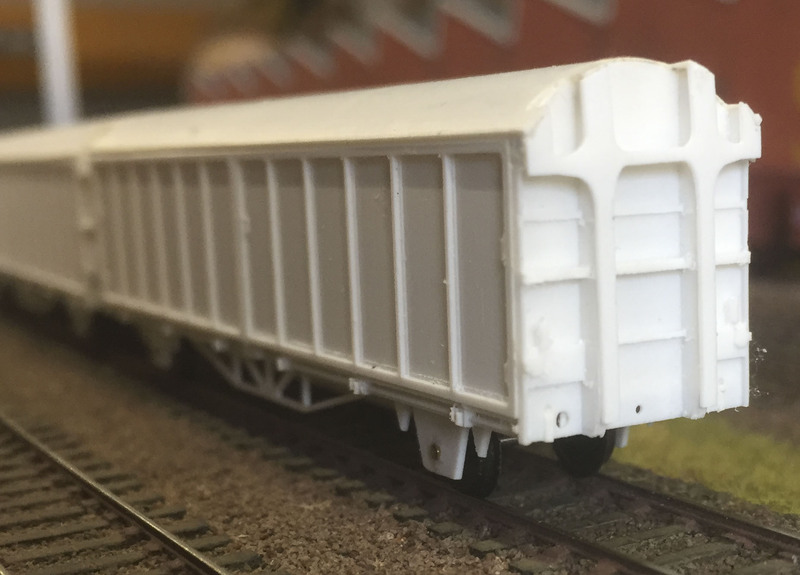 The latter might be something more environmentally friendly of course, such as a load of sand drenched with PVA glue, this only because there is enough space internally in this wagon. It is not a fast built as the whole process for milling and building one of these takes at least 3 hours. 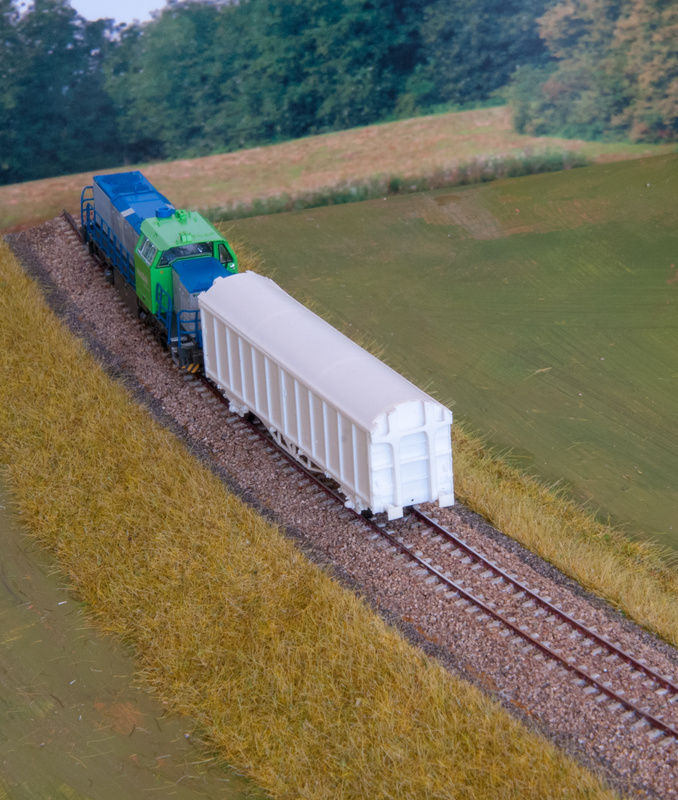 Thus a quicker approach would be to modify the new FLM Danish/Swiss wagon, which only has wrong (closed) reinforcements below the wagon and different heads. But for the earlier Hbis version of this wagon that would be impossible, whereas that wagon can now be done in the same way after some additional drawing strokes in Corel. And with slightly more work for entire different side walls this approach opens up the whole range of all the Dutch NS Hbis versions, which are not available as RTR at all.